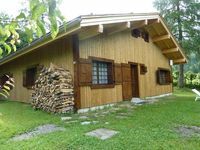 Property 11: Charming cottage with beautiful views of the castle, mountains and Lake Annecy. We stayed for 1 week in the house with 4 aduslts and 2 kids. The house is great, had good vibes and enough space for all of us. Good kitchen equipment too, we like to cook so very happy to find a good oven/grill, good pans/tableware, breadtoaster, mixer and blender and a big fridge/freezer. 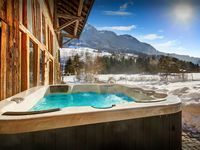 The location is easy to reach by car and bus and 8 minute drive to the city centre/restaurants and ski slope. The owners are very friendly and communication and response time was really good. All in all we will for sure come back to this place sometime! Thanks a lot. We&rsquo;d highly recommend this place to anyone! We&rsquo;ve just returned home following a great weeks holiday. The chalet is stunning and beautifully decorated with everything we needed. It is situated close to the river in a stunning setting. It was lovely to take the short stroll into the village to collect fresh croissants for breakfast. Also within a short drive there are many great things to see and enjoy especially if you love being outdoors. We had brilliant trips to lake Annecy and Chamonix/Mont Blanc. Carole cooked two super meals for us and was so very helpful in making our holiday a truly memorable one. The pool and hot tub alongside the communal lounge and dining room were a real added bonus. We&rsquo;d highly recommend this place to anyone! Thank you for everything.